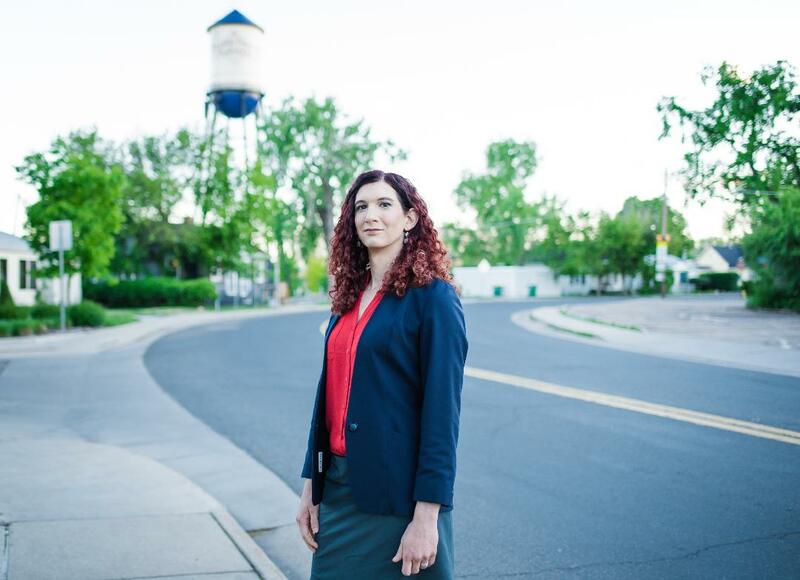 Editor Note: The Nation Report will be bringing our readers interviews with Colorado candidates who are challenging incumbents in November’s election. Brianna Titone is challenging Republican incumbent Representative Lang Sias in House District 27. TNR: I saw you at the Capitol quite a bit. Was there something that pushed you over the edge to run or was it a progression of things that led you to run? Brianna Titone: For me, I’ve always been someone who likes to go out of their way to do good things. I was looking for something to do that was going to fulfill that need for me. I was looking to be a law enforcement officer for a while, first in the FBI and then with Denver PD. That was before I came out as being trans. Which I don’t know how I really would have kept that from the FBI. i didn’t really know it to myself yet so I don’t think I would have been lying to them at that point. TNR: Would you have felt it necessary to keep this from them or is there some complexity in applying to work for the FBI if you are trans? I didn’t know if that was going to be something to disqualify me. I just didn’t have a lot of experience with that. It probably would have been OK. I just didn’t know any people who were trans in the FBI. But I wasn’t admitting it to myself yet about who I really was. But that is what I originally was going to try to do, was to do something good for the community by putting bad people behind bars. When that kinda went to the wayside, I was looking for something else to do. And I went to the Lobby Day for One Colorado, and that was the first time I had ever been down to the Capitol. And I had a good time meeting new people, and talking to legislators. And I was still kinda becoming myself still, and finding my confidence. So at that point, I really wasn’t ready to do anything. But then I continued to follow what One Colorado was doing with the LGBTQ issues. I went to the Women’s March. And then I went to the Muslim Ban March. And I went to a lot of other different events supporting different causes, and I joined up with the Jefferson County LGBTQ Caucus. And that was in about February of 2016. What we had learned there, we were trying to find out what we could do as a caucus to push policy or have something we could be active in doing. And I had seen that a town in Ohio had a Conversion Therapy ban they had pushed. So after being down at the Capitol and seeing the Conversion Therapy Ban shot down three times at that point in Colorado, I said well maybe we can start with municipal bans, and get some support at the local level and kind of bring it up at the state level. And if we can convince enough cities across Colorado that we don’t want this in our town, that they’ll have no choice but to say OK, maybe we should take this seriously at the Capitol and actually get it to a vote and get it out of the committee. So the caucus liked the idea, the caucus being like five people. There were five of us at the time, very small group. We kind of got things rolling, and started contacting people and researching what they did in Ohio. We were figuring what our strategy would be. And then I went to Westminster kind of on a whim and I brought a copy of the proclamation that we drafted ourselves, based on some other proclamations we found. And during the break at the meeting, I went up to Councilwoman Maria Decambra and I said I with the caucus from Jefferson County and we’re looking for some city councils to take interest in this proclamation. She loved the idea and she got all the other people involved with that and started the ball rolling with that and we got the proclamation done pretty quickly. Edgewater followed pretty soon after that. And that was before the election in 2017. And leading up to that election, being part of the Jefferson County Democratic Party, the leader of the Democratic Party Cheryl Cheney, she appointed me as Captain at-Large. I think she saw my interest and passion in everything. And she knew I was kind of thinking about doing something. And when I asked her a lot of questions about what I could run for, what I could do, she really didn’t push me, but she gave me the information that I needed to make the decision myself. TNR: What was that information and decision? It was to run for office in House District 27. But for the election of 2017, I didn’t know if I could do it because as a trans person, nobody had done that before at the state level in the whole entire US. So I was looking at this thing, looking at my district being that it’s pretty conservative, and it hasn’t seen a Democratic in like ten years, I wasn’t sure it that was ever going to happen. And then Danica Roem broke that glass ceiling in Virginia in 2017. And it was a really, really, hard district that she flipped. And when I saw the numbers that she had overcome, and who she was, and what she stood for, I said we could do that here. That’s not even that big of a margin to overcome. TNR: Is there anything else you want to say about that? I met with a bunch of people a few times over the course of about a year before I finally declared. I met with Senator Dominick Moreno, and Representative Chris Kennedy just to kind of find out what it took to run, what I should expect. And neither of them ever brought up the fact that being trans was going to be an obstacle. I don’t think that they even thought that it was going to be an obstacle, but in my mind, I couldn’t really get over that until I saw Danica Rohm actually win. But it’s like everyone says, running for office is really, really hard. It’s a sacrifice, and it’s a commitment. And to me, you know I was trying to become an FBI agent. There’s a lot of dedication and commitment that goes into that. So running for office didn’t seem to be that much of a stretch in terms of that kind of commitment, dedication, and hard work that it would take. Because getting into the FBI is like a three year process. And I got too old to finish at 37. That’s the cutoff. And I’m 40 now. TNR: At the Capitol this past year I saw you testify at the Conversion Therapy committee hearing, were there other bills that brought you to the Capitol that were important to you? I testified at the Conversion Therapy bill. I testified twice for that one at the House and the Senate. I testified at the Senate hearing for the Transgender Birth Certificate bill. I testified against the bill that would have prevented LGBTQ people from adopting. I testified for the Defense of Freedom bill that Joe Salazar sponsored. The Ralph Carr Defense of Freedom bill. I also testified twice for the Net Neutrality bill which I’m actually going to try to work with Representative Hanson on for next year’s bill because that’s part of what I’m studying at DU. I would have been there more, but I have a full-time job. Sometimes I got to a rally, or the CCRD, but I didn’t have time, so I kind of had to pick and choose. TNR: What other bills were important to you that you missed not being able to testify. I paid attention to the ones I had been following in previous years because I had already had a special interest in those. There were a lot of other bills I could have, but I felt like for actual testimony for those bills, I had actual experience and expertise and skin in the game to testify against those, where something pertaining to something like healthcare, I’m not quite an expert in that field to have any testimony that would bring any substantial information to that area. TNR: You list on your website issues that you would get behind or that you would change, say for example TABOR is one of them. What would you like to see happen with TABOR? Because being a complicated Amendment, it can’t just be repealed. What parts of TABOR would you like to see changed? In a perfect world we would not have those restrictions tying us back. But we have seen in the past, some ways of getting around the strangle-hold and with our economy as good as it is, we should be able to take advantage of that. And we’re not really putting money into things we really need to, schools and transportation being two of the main issues that really take a lot of money to put in good infrastructure for those things. So if we could even start with some kind of Amendment to relieve TABOR for a limited amount of time, if something that might be palatable for both sides, but I need to look at the issue a little more closely to see what’s already been done, what works, what’s possible because being a new person to politics, I don’t have a lot of the answers. TNR: Regarding your Republican opponent, can you talk about what you would have done differently? He voted against the Conversion Therapy bill in the House. The Conversion Therapy bill is to prevent child abuse of kids. So I definitely would have voted for that. He’s also voted pretty strongly on a lot of gun rights bills. He voted against the Red Flag bill. And he voted for concealed carry for anyone without a permit which I wouldn’t have done. I think he voted against the CCRD as well. But mainly like civil rights, women’s rights, and common sense gun safety. I think he voted for the bump stocks. To not ban the bump stocks, I think is a reasonable thing to do. TNR: There were a lot of oil and gas bills that failed. Although there isn’t a ton of fracking in Arvada, in the House you would be approached with bills, how do you feel about the oil and gas industry in Colorado? As a geologist, I understand maybe a little bit better than some people do about that industry, although I still have a lot to learn. I was in the mining industry, not the oil industry. But I understand that there’s a lot of economic tie-ins to the oil industry. It’s a complicated issue that goes beyond the borders of Colorado and into a lot of strategic decisions that go on in the US for energy and energy independence. So we do have an immense resource of especially natural gas here and oil, but we do need to work towards renewable energy as a priority. But we can’t just flip a switch on the oil industry. So we need to work on a phased approach to reducing oil and gas consumption overall as a society which will help, and also just making sure that the regulations are in place for oil and gas drilling that is close to any homes, noise is abated, and gasses are trapped and are not affecting people around them. I actually had a geologist tell me who works in the oil industry [that] there are a lot of ways that they can do drilling in a crowded place very effectively and keep people safe around them. I don’t think that we’re really doing that enough here, or it’s not being enforced. So I would like to see the current regulations and make sure that they’re being enforced, and look into ways we could do it safely as we phase out oil and gas in Colorado. TNR: In your campaign so far, what are some issues important to people in your district? Mainly what people have been talking about is education. Education. The cost of healthcare. And transportation. TNR: And specifically about education, is it funding? Funding. Teacher pay. Public school funding. The rising cost of healthcare and healthcare transparency. And the cost. TNR: Do people regret not voting for Amendment 49 in the last election for Universal Healthcare? TNR: And how about transportation? People are just not pleased with public transportation and how long it takes to get places. A lot of people would like to take the bus, but when it takes an hour to take the bus. The line coming into Arvada has been delayed, and delayed, and delayed. And people are just really getting tired of the promises that are not being kept. We’re growing very quickly and we need to respond to the growth with a network of public transportation, but if we don’t have the money to do it, it’s never going to happen. TNR: What do you think your first bill might be? Probably the Net Neutrality bill. TNR: How would you frame that? Well because I’m piggy backing it with my graduate class as a research paper, I’m going to be doing a lot of research on net neutrality as a history, what’s been going on up until now, what other states are doing, kind of an analysis of the federal law, how it’s changed and what we can do. And maybe ways of exploring how competition could work if net neutrality doesn’t exist as we would like it to. TNR: If I could be more clear, how would you like it to be? I would like to see net neutrality back the way it used to be, a free and open internet that every bit is created equal. But because the federal law is not written that way, people in Colorado can’t make laws that preempt federal law. So we have to come up with ways that work around that to try to prevent a lot of the anti-competitive that net neutrality is supposed to be protecting us from. TNR: If there’s one thing you want people to know about you what would that be? I’m not running for office because of who I am, it’s what I aspire to bring to the community. I have a long track record of working in the community through various volunteer organizations. I mentioned to you on the phone about the Necrosearch. It helps law enforcement locate clandestine graves and we provide a service free of charge to have people do that. So we bring equipment and our expertise where law enforcement doesn’t have access to that. And we can bring a lot of scientific knowledge to help them solve cases that they might not have that resource to do. And it saves them a lot of money because we do that work for free and they could hire a consultant who may not even be qualified as much as we are. The organization’s been around almost 30 years. I’m a new member and I’m trying to learn a lot about how this all works from the people that are there. These are the kinds of things that I always aspire to do for my community. I don’t find myself to be a politician in the fact that I have an ulterior motive other than my community and the state at large to do what’s right.